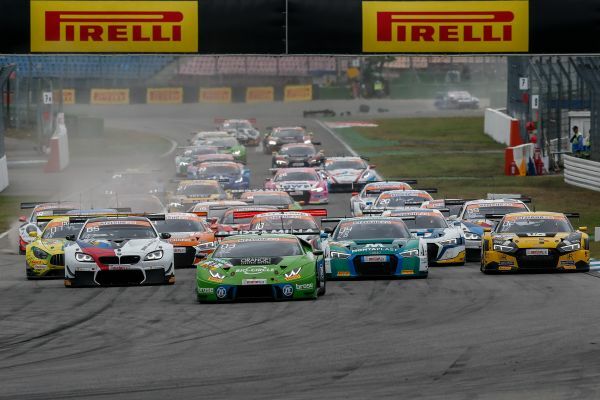 The 2019 season of the ADAC GT Masters will be even more exciting with the introduction of a new points system, giving more teams the chance to score championship points in one of the season's 14 races. A new method of allocating points will ensure that things remain close in the standings, and 'handicap weights' which serve to ensure fairness between driver pairings have also been altered. We'll get a first introduction to the 2019 ADAC GT Masters season on 8th and 9th April at the Motorsport Arena Oschersleben with official pre-season testing which will take place there three weeks before the start of the season on the weekend of 26th - 28th April. As of this season, the first 15 cars will score championship points in races whereas the top ten finishers used to take points according to the previous system utilised since 2011. Points will be awarded on the following basis in future: 25-20-16-13-11-10-9-8-7-6-5-4-3-2-1. The new system of allocating points will be used for the drivers' and team standings as well as in the Pirelli Junior category and Pirelli Trophy class. Thomas Voss, ADAC Motorsport and Classic Director: "We expect to have a large field of entrants once again this year with more than 30 drivers contesting the ADAC GT Masters. The new points-scoring system has been introduced to promote fairness. More drivers and teams will now have a chance of taking championship points and of thus being rewarded for their performance thanks to this new system." The handicap weights that have to be carried in the interests of sporting fairness depending on how driver pairings are rated according to the FIA have also been revised. Whilst the maximum handicap weight for two professional drivers used to be 30 kilos previously, that has now been reduced to 20 kilos for the 2019 season. Similarly, the amount of extra weight for driver pairings where one is a 'professional' and the other 'semi-professional' has also been reduced. Driver pairings, in which at least one is an amateur and holds the FIA's 'Bronze' licence, will continue to remain free of handicap. Official pre-season testing for the ADAC GT Masters and the new ADAC GT4 Germany will take place April 8th/9th in the Motorsport Arena Oschersleben. Drivers contesting the ADAC TCR Germany and the ADAC Formula 4 will prepare for their new season April 9th/10th. Die Team Rosberg GT3-Bilanz: "ADAC GT Masters auf sehr hohem Niveau"